Happy second Thursday, and get your engines star-ted! We hope you’ll enjoy this throwback post from May 2012. Bon appetit! I ran across the most wonderful compendium of slidey and twisty puzzles this past week when sharing the famous 15-puzzle with one of my classes. It’s called Jaap’s Puzzle Page and it’s run by a software engineer from the Netherlands named Jaap Scherphuis. Jaap has been running his Puzzle Page since 1999. Jaap first encountered hands-on mathematical puzzles when he was given a Rubik’s Cube as a present when he was 8 or 9. 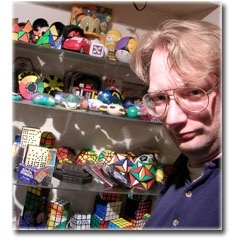 He now owns over 700 different puzzles! Jaap’s catalogue of slidey and twisty puzzles is immense and diverse. Each puzzle is accompanied by a picture, a description, a mathematical analysis, and–SPOILER ALERT–an algorithm that you can use to solve it!